Photogalley offers fundraising cookbooks for the chef in you. Choose between three (3) binding styles. Choose your creation method and start creating your cookbook. Photogalley is the only Fundraising Cookbook Publisher that allows Full Customization of your cookbook. Submit: design online with blank template or templates. If you have cookbook finished in PDF format, please go to our Publish a Book section to upload the PDF file; or if you want to submit your handwriting recipes, please visit Fundcraft cookbook program. 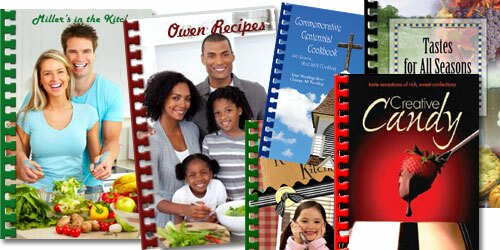 for fewer copies look at our Photo Cookbooks.